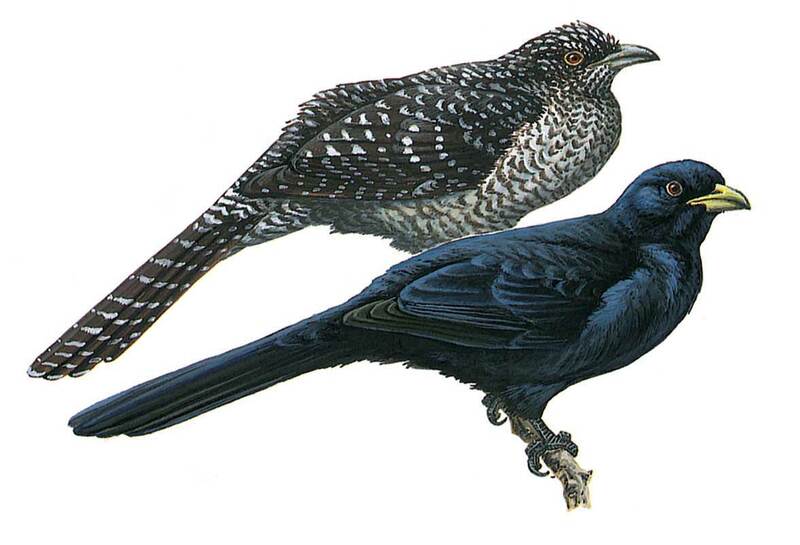 Unmistakable cuckoo-like bird with relatively thick bill, short wings and rather long tail. Male black with bluish gloss and bright yellow bill. Female has drab brawn upperparts, thinly streaked and spotted white; whitish throat heavily streaked dark brown, rest of underparts densely barred with dark brown and buff; dark tail with many thin whitish bars. Immature resembles female. When not alarmed has characteristic stance with long tail held downwards, hunched lower-back, bulky breast and (in calling male) uptilted head and bill. Cuckoo-like direct flight.